A passion for language and getting it right. Welcome! My name is Susana Sherman. Born in Havana, Cuba, I emigrated as a child to the United States, becoming a naturalized U.S. citizen in 1972. I have a Bachelor of Arts in Economics with a minor in Mathematics from Rutgers University, granted in May 1978. Shortly after graduation, I lived for two years in Venezuela, where I first tried my hand at the art of translating from English into Spanish. Returning to the United States in 1981, I embarked upon a career in telecommunications, which culminated in early retirement from Lucent Technologies in November 2006. During my tenure as an engineer and software professional, I capitalized on my language skills producing and responding to bids and proposals; giving product demonstrations to clients within the U.S. and internationally, in both English and Spanish; and developing and providing customer product training in both languages. I enjoy experiencing world cultures, and have traveled throughout the United States, Canada, South America, Europe and Asia. My family tree includes French, Spanish, English and Irish branches. I find those countries especially interesting. A passion for language and a love of reading and writing in both Spanish and English led me to pursue a second career as a professional translator and obtain a Certificate of Proficiency in English-Spanish and Spanish-English Translation from Rutgers University, granted in May 2010. Although my native language is Spanish, I consider English to be a second native language. My translations are accurate, professional, timely and well-researched. 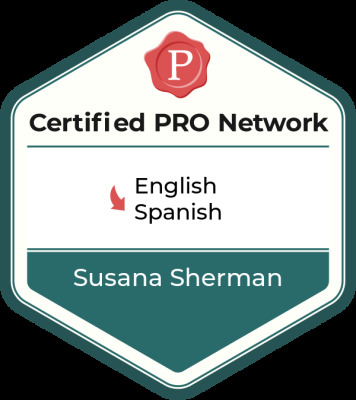 I am a certified translator and member of the American Translators Association (directory listing) and have public profiles on LinkedIn and ProZ. My goal is to provide professional, accurate, consistent and well-researched translations of the highest quality, within my clients’ budgets and schedules. To that end I own and use Wordfast Pro, a professional translation memory tool, for translation and terminology management. I am also skilled at working with SDL WorldServer and other translation management tools. I can work with existing translation memories (Wordfast Pro-compatible or TMX format) and glossaries, or create and provide them if requested. I am able to accept as source text most MS Office document types, as well as editable PDF, Adobe InDesign, FrameMaker, HTML, XML and other document types supported by Wordfast Pro. I can also convert most scanned documents, graphics and images to a digital text format such as PDF or MS Word as project needs dictate. I handle most jobs on my own, but work with a highly professional group of colleagues with complementary skills and expertise as needed. I'd love to hear from you and discuss your translation project needs.